Recently, well a couple months ago really, I started getting into more, shall we say traditional, shaving techniques. I had been suffering for years from razor burn, razor bumps, and an overall poor shave, to the point, I dreaded shaving. I would go a couple days without shaving on purpose, actually to be honest, I would wait until having the facial hair either irritated me, or it just looked ridiculous. See I have the odd genetics, that leaves me with extremely dark brown hair, almost black, and very bright red facial hair. A couple weeks ago, I placed an order with http://www.fendrihan.com for a variety of shaving supplies, to try out different things. 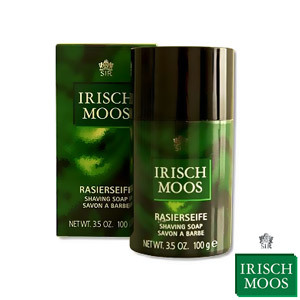 Today was my second use of Sir Irisch Moos Shaving Soap. I had read a great review from Shaving101 and wanted to try. It was relatively cheap, so i figured it was worth the try. The shaving soap is different from cream, both traditional and the pressurized cans, that i have used in the past. It comes in a stick, and you just apply it to your face. Word to the wise, wet your beard first. When that is done, just lather up with your brush, and that’s it. The lather isn’t as foamy as any of the creams, but it is just as slick. So far, I believe this soap will become my goto for shaving, it offers good lubrication, and nice lather. On top of that, it has a nice smell, very similar to Irish Spring Soap. anyways, I’ll be updating my experience along the way.